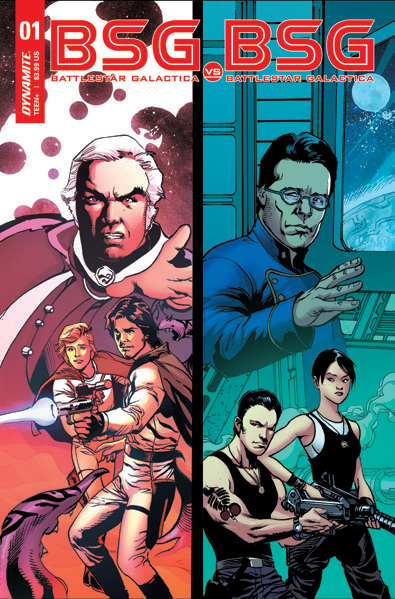 Dynamite Entertainment and Peter David Present BSG Vs. BSG Crossover! Dynamite Entertainment is proud to announce the ultimate Battlestar Galactica series that’s been nearly 35 years in the making – The Classic Battlestar Galactica team Vs. the New ones from Ron Moore and Sy Fy Channel! 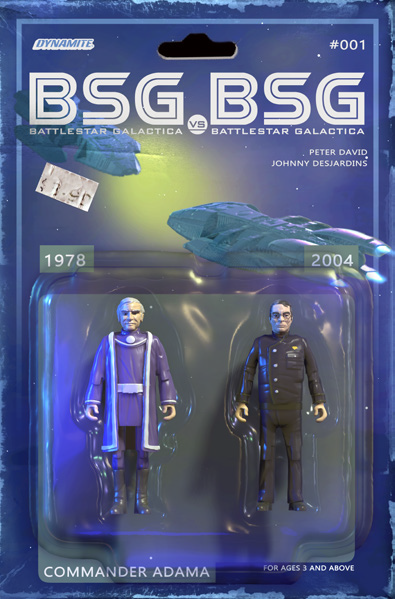 THE crossover project bringing together the continuities of both the classic 1978 and reimagined 2003 BSG series. In the new Battlestar Galactica miniseries, the discovery of Kali – the last of the reptilian parent race that created the Cylons – serves as the catalyst for a face-to-face meeting between the crews serving Commander Adama (including Apollo and Starbuck, three characters immortalized on the small screen by actors Lorne Green, Richard Hatch, and Dirk Benedict, respectively) and Admiral William Adama (of the 2003 Reimagined BSG series, as played by Edward James Olmos). Sparks will fly as Lee Adama, Kara Thrace, and their fellow Viper pilots meet their strangely familiar counterparts… and discover the threat that two colliding universes of Cylons pose! One of the cornerstones of their publishing line, Dynamite Entertainment has been developing Battlestar Galactica comic books since 2006, focusing on each incarnation of the franchise from the classic continuity of the 1978 television series, to the Galactica 1980 follow-up, and finally to the reimagined series aired on Syfy from 2003 through 2009. Peter David is a prolific author whose career, and continued popularity, spans nearly two decades. He has worked in every conceivable media: television, film, books (fiction, non-fiction, and audio), short stories, and comic books, and acquired followings in all of them. In the literary field, Peter has had over fifty novels published, including numerous appearances on the New York Times Bestsellers List. His comic book resume includes such varied and popular titles as Supergirl, Young Justice, Soulsearchers and Company, Aquaman, Star Trek, The Phantom, and many others. In TV and film, David’s creative credits include Space Cases, Babylon 5, two Trancers films, and Oblivion, to name a few. David has earned multiple awards for his work, including a 1992 Eisner Award, a 1993 Wizard Fan Award, a 1996 Haxtur Award, a 2007 Julie Award, and a 2011 GLAAD Media Award. 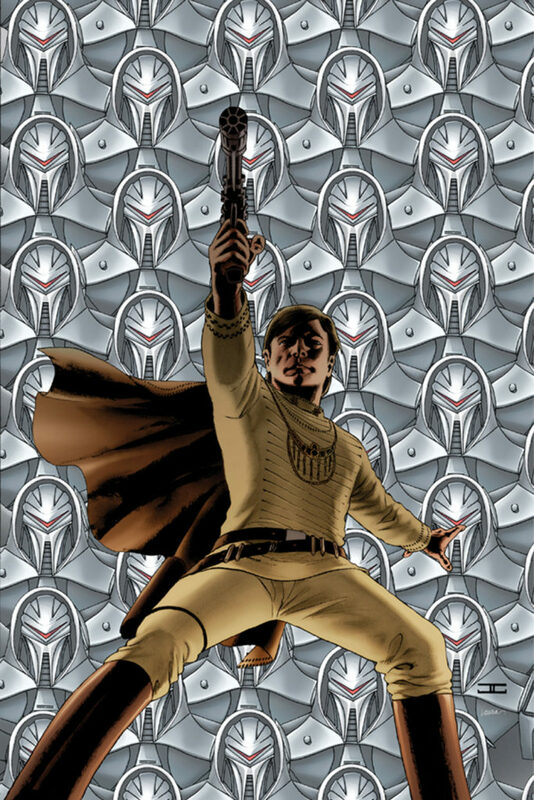 The David-helmed Battlestar Galactica project will be solicited in Diamond Comic Distributors’ Previews catalog, the premier source of merchandise for the comic book specialty market, and slated for release this Fall. Comic book fans are encouraged to reserve copies with their local comic book retailers. 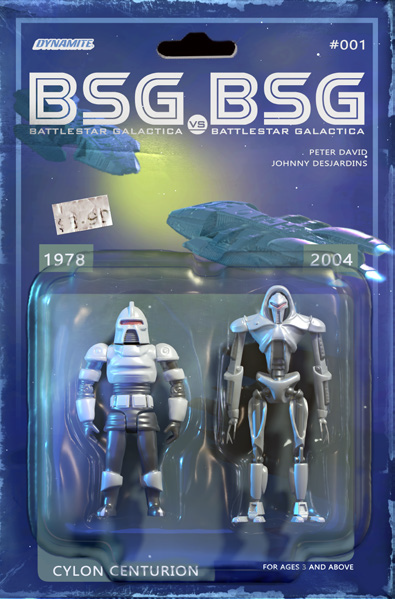 Battlestar Galactica will also be available for individual customer purchase through digital platforms courtesy of Comixology, Kindle, iBooks, Google Play, Dynamite Digital, iVerse, Madefire, and Dark Horse Digital.